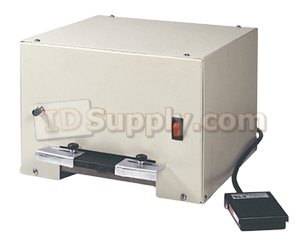 4500LA Heavy Duty Electric Slot Punch with adjustable side guides. Punches plastic material up to .070 thick. Hand and foot switch activation. Hardened premium steel dies with a fast cycle time of approximately 1 second. This unit has a Height of 8 1/2", Width of 12" and Depth of 13". Slot size is 1/8" x 9/16". One year warranty.